(Reuters) – Syria’s government hailed as a “victory” a Russian-brokered deal that has averted U.S. strikes, while President Barack Obama defended a chemical weapons pact that the rebels fear has bolstered their enemy in the civil war. President Bashar al-Assad’s jets and artillery hit rebel suburbs of the capital again on Sunday in an offensive that residents said began last week when Obama delayed air strikes in the face of opposition from Moscow and his own electorate. Obama dismissed critics of his quick-changing tactics on Syria for focusing on “style” not substance. And while thanking Putin for pressing his “client the Assad regime” to disarm, he chided Russia for questioning Assad’s guilt over the gas attack. BEIRUT (AP) — A high-ranking Syrian official called the U.S.-Russian agreement on securing Syria’s chemical weapons a “victory” for President Bashar Assad’s regime, but the U.S. warned Sunday “the threat of force is real” if Damascus fails to carry out the plan. The USA originally called for the destruction of all Syrian chemical weapons by last week to avert military action. Now, Syria has close to a year to come up with an inventory list of what it has. Syrian considers this an important victory. 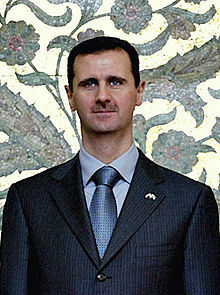 However, any ‘victory’ that the Assad regime is having is temporal. Syria will change. Eventually Syria, and others in the Middle East and North Africa, will become supporters of the future King of the South (Daniel 11:40-43) and be aligned with Egypt per Ezekiel 30:1-9. Russia, with all of this, has shown that it does not abandon its allies as fast as the USA has done (such as Hosni Mubarak to cite one example). The current deal may extend Syrian President Bashar Assad’s reign, increase Russian influence, and impact USA credibility, but the time will come when Bashar Assad will change, die, or be exiled. The USA still wants him out, also. The situation with Iran, Syria’s closest ally, will change as well. This entry was posted on Sunday, September 15th, 2013 at 11:45 am	and is filed under Prophecy.